In our routine lives, there is a great importance of the kindness and the power of God Shani. 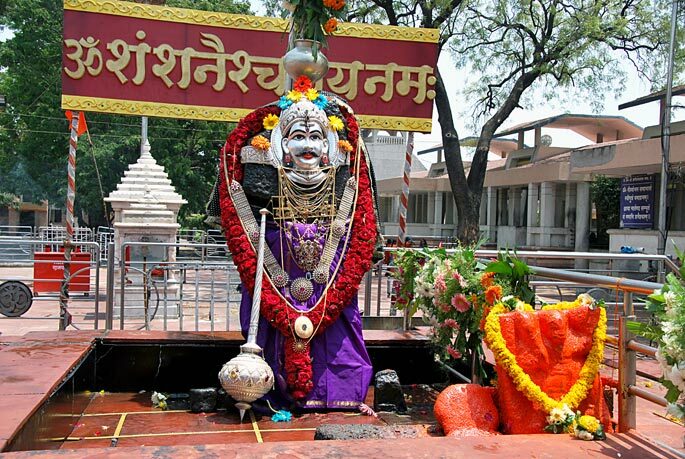 Shani occupies the seventh place among the nine planets which govern the world. This is viewed as unlucky in conventional astrology. As per ‘Kaagol Shastra’, the distance of Shani from the earth is 9 crore miles. Its radius is about one billion and 82 crore and 60 lakh kilometers. And its gravitational force is 95 times higher than that of the earth. Planet Shani takes 19 years to complete one revolution around the Sun. The astronauts have viewed the Shani’s colours as beautiful, strong, influencing and eye-catching. It has twenty two satellites in its ring. Shani’s gravitational power is more than that of the Earth’s. Therefore, when we think good or bad thoughts and make plans, they reach Shani by the strength of his power. In astrological terms, the bad influence is considered as unlucky. But the result of good deeds will be good. Therefore, we must understand God Shani as a friend and not as foe. And for bad deeds, he is Sade Saathi, disaster and an enemy. As regards the birth of Shani, there are different stories. Foremost and accepted is the one in the ancient ‘Scanda Poorana’ of Kasi Khanda which is as follows. God Soorya was married to Daksha Kanya Sadnya. Sadnya could not tolerate the radiance of God Surya. She used to feel that by doing penance she could increase her brilliance. Or, by the power of her penance, she could diminish the glare of God Surya. But for God Surya, she was a spouse worshipping wife. From God Surya, she had three children. One was Vaivastahva Manu. The second was Yama Raj. And the third was Yamuna. Sadnya loved her children very much. But, she was very upset with the radiance of God Surya. One day, she thought that she would separate from God Surya, go to her parents’ home and undertake great penance. And if there was opposition, she would go far away to a lonely and undertake great penance. By strength of her penance, Sadnya created a ‘Chaya’ (shadow) of herself and named her Suvarna. And, and then the shadow of herself became Suvarna. After handing over the children to Chaya, Sadnya told her that Chaya would thereafter play the role of womanhood and nurse her three children. She told her if any problem arose, she should call her and she would come rushing to her. But she cautioned her that she must remember that she was Chaya, not Sadnya, and nobody should know this difference. Sadnya hander over her responsibilities to Chaya and went away to her parents’ place. She went home and told her father that she could not stand the radiance of God Surya. And therefore, without telling her husband she had come away. Listening to this, her father scolded her very much and told her that without being called, if the daughter returns home, both her and her father would be cursed. He told her to go back to her home immediately. Then, Saudnya began to worry that if she went back, what would happen to the responsibilities which she had given to Chaya. Where would Chaya go? And their secret would be exposed. So, Sadnya went to the dense jungles in Uttar Kurukshetra and took repose there. As per the second story, the creation of God Shani was the result of Maharishi Kashyap’s great ‘yagna’. When God Shani was in the womb of Chaya, Shiv Bhaktini Chaya was so engrossed in penance of God Shiva that she did not care for her food even. She prayed so intensely during her penance that the prayers had a profound influence on the child in her womb. As a result of such a great penance of Chaya, without food and shade in the blazing sun, the complexion of God Shani became black. When God Shani was born, Surya was surprised to see his dark complexion. He began to doubt Chaya. He insulted Chaya by saying that this was not his son. From birth itself, God Shani had inherited the great powers of his mother’s penance. He saw that his father was insulting his mother. He saw his father with a cruel gaze. As a result his father’s body was charred black. The horses of God Surya’s chariot stopped. The chariot would not move. Worried, God Surya called out to God Shiva. God Shiva advised God Surya and explained to him about what had happened. That is, because of him the respect of mother and child had been tarnished and insulted. God Surya accepted his fault and apologized. And regained his earlier glorious looks and the power of his chariot’s horses. Since then, God Shani became a good son to his father and mother and an ardent disciple of God Shiva. Remember that God Shani is the judge of our thoughts. In this society, whenever people become preys to lust, anger and greed and spoil their purity and with full awareness commit sins, injustice and crimes on others all around them and while hiding in such darkness they commit such sinful deeds, they are mistaken that whatever deeds they are doing is not being watched by anybody. And then by doing so, people begin to believe that God is pleased with them and in such a state of vanity and ego, they begin tom believe that they are everything. They begin to feel that there is no God and they are God himself. Thus, to make such people repent for their follies, and to purify them God Shani punishes them. 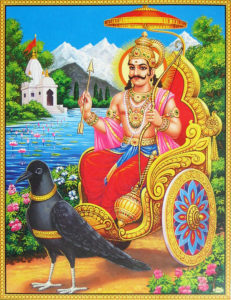 So Sade Saathi starts, God Shani becomes the Judge and after punishes the person and purifies him. Firstly, remember that God Shani has a delicate gaze. Secondly, he gives the fruits of one’s ‘Karma’. Thirdly, whatever a person does, God Shani grants him the results accordingly. God Shani gives proportionate happiness and unhappiness to people based on their ‘Karma’.